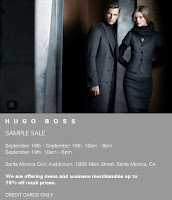 Hugo Boss Sample Sale in L.A., 9/16-9/18! - shopalicious! Hugo Boss Sample Sale in L.A., 9/16-9/18! Get ready for the Hugo Boss Sample Sale in L.A., featuring both Men's (Suits, Shirts, Dress Trousers, Casual Trousers, Jeans, Shoes, Bags, Cufflinks, Swimwear and much more...) and Women's (Dresses, Trousers, Skirts, Shoes, Handbags and much more) all from the designer's Spring 2009 Collection with savings up to 75% off of retail prices! Why: Here's your chance to purchase classic Hugo Boss pieces straight from the designer's Spring 2009 Collection at up to 75% off retail prices.